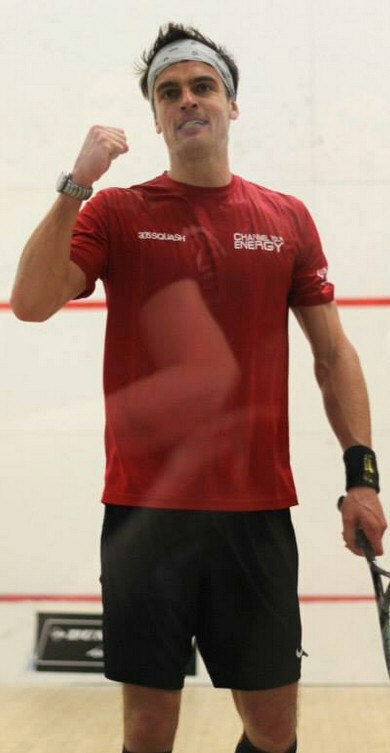 Ryan Cuskelly claimed the biggest PSA tour title of his career today, beating higher seeded LJ Anjema 3-0 in the final of the Northern Ontario Open. Anjema was favoured coming into the match, having reached the final without dropping a game or spending more than an hour on court. However, Cuskelly came out with the same pace and dogged retrieving that saw him through two toug matches against Alister Walker and Cesar Salazar. 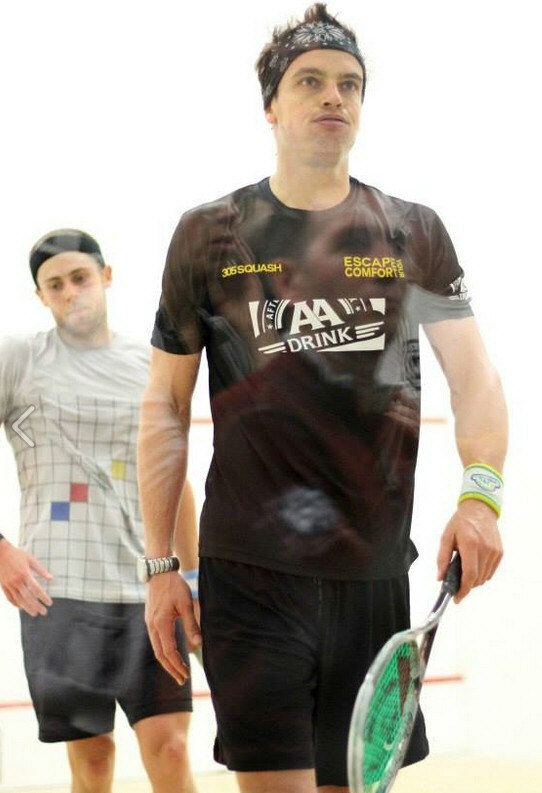 This was a rare all-lefty battle, which meant play was primarily happening down the right wall; an odd sight in pro squash! Both players deserve credit for maintaining a relatively free-flowing brand of squash, which is sometimes difficult when two southpaws face off. 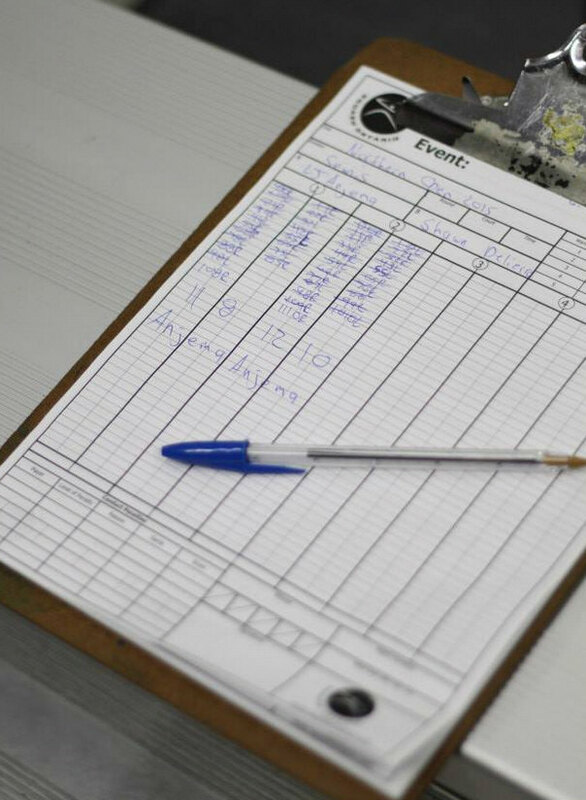 The capacity crowd of over 100 expected the Dutchman to overcome a first game deficit, as he had done in every one of his previous matches. However, after trading lucky winners to reach 10-all, Cuskelly hit a crisp backhand drop and converted his second game ball when Anjema tinned an ambitious drop of his own. The Australian maintained a small lead throughout the second game, neutralizing Anjema with lobs and counterdrops. LJ was earning himself good positions by hitting penetrating length, but could not find the required severity in attack to get Cuskelly out of rhythm. At 9/6 up, Ryan took a short break for a blood injury to his knee. This seemed like an opportune time for Anjema to make his move, but he was still unable to unseat Cuskelly and soon the underdog was 2/0 up. Sensing a possible 3/0 final (for the fourth consecutive year! 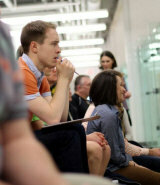 ), spectators got behind Anjema in the third game. Although he was left flat-footed several times, LJ finally began to mount a comeback at 4/7 down. The action became even tighter and more deliberate as he tried to up the pace and test Cuskelly physically. With both players beginning to fatigue slightly, Cuskelly held strong and eventually closed out a lengthy final game without ever letting Anjema within striking distance. An extremely impressive performance from the 27 year old Australian, who showed a marked improvement from last year's quarterfinal loss here. Clearly intent on taking the ball earlier, harder and with more attacking intent, he beat three quality opponents in convincing fashion. LJ Anjema continued his clinical path through the draw tonight with another 3-0 victory, this time over Canadian Shawn Delierre. True to the form of his previous two matches, the Dutchman started tentatively and played primarily straight drives. 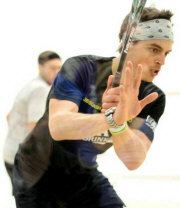 Making a few unsettled errors, he found himself down 6-8 to the Canadian #1, who was once again playing very tough squash. For the third night in a row, LJ rose to the occasion, increasing the pace and pressure to take five consecutive rallies and the game. This constant intensity led to some uncharacteristic errors from Shawn in the second game, who must have felt like he needed to produce something special just to win a rally. 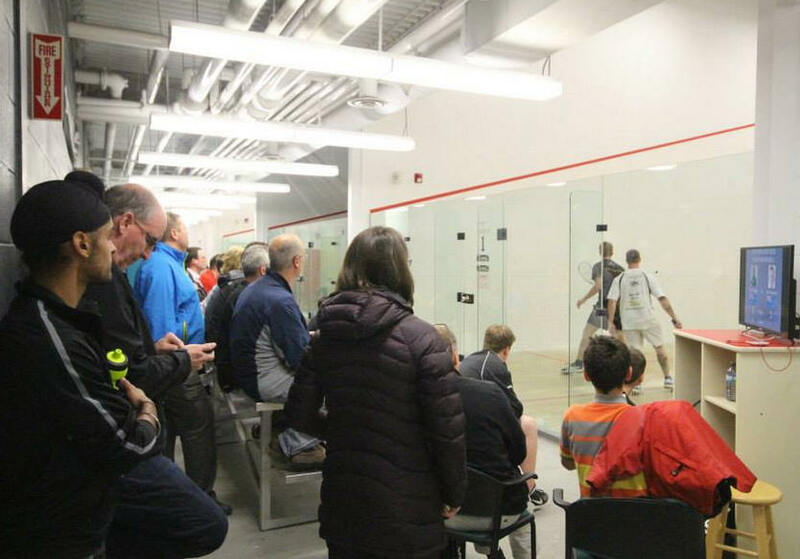 The capacity crowd were looking to get behind the Canadian, but time and again saw their hopeful come out on the losing end of tough rallies. Shawn forced a second game tiebreak but never held gameball and was soon down 2-0. The squash was very contained and thoughtful, neither player taking any undue risks. Sensing his tournament run nearing an end, Shawn found some extra energy in desperation while matchball down. But a No Let decision after Anjema had passed him with a straight drive from the front right marked the end. LJ has been entirely composed all week, maintaining a stoic disposition even in the most critical situations. Having not dropped a single game and spending less than 3 hours on court, he will feel confident before tomorrow's final. Cesar Salazar produced a Herculean effort in the second semi, pushing Ryan Cuskelly to the brink. 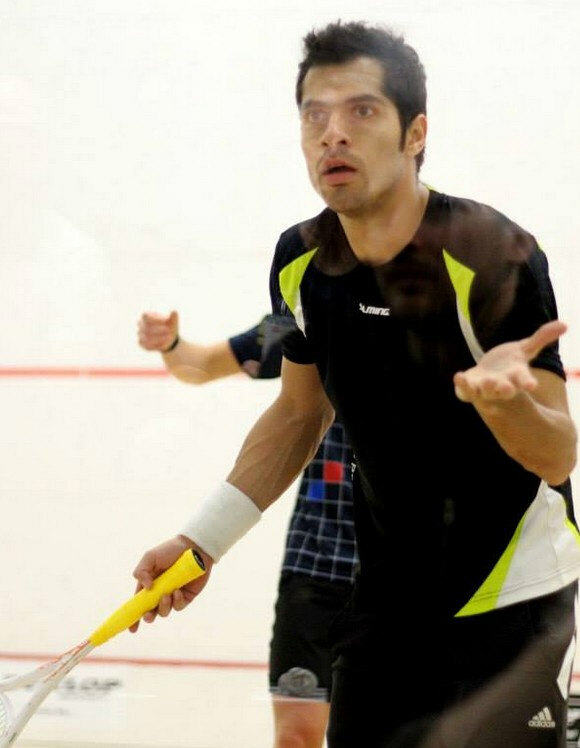 The Mexican scored a massive 100+ minute victory over Diego Elias last night, and was clearly feeling the effects as he went down 11/2 and 6/1 before even featuring in an extended rally. However, as often happens, the first wall of fatigue is the hardest to push through. As his body seemed to loosen up, Salazar began covering Cuskelly's sharp attacks more effectively, playing some excellent counters and flicks. This clearly took Ryan by surprise, as he had been on cruise control until this point. Cesar leveled at 6-all, and we had a match on our hands. 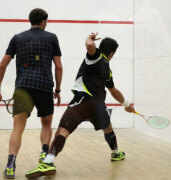 Switching demeanour from defeated to focused, Salazar found the motivation to accept the pressure Cuskelly was applying. Every inch of court was utilized and covered, with one player often ending up well out of position at the end of a rally. 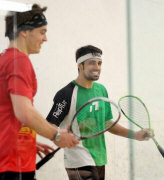 Winning the second game on a No Let, Salazar was a new man and looked a real threat to win the match. The Aussie continued to control 80% of points in the third, but couldn't quite put the ball out of Cesar's reach. Relishing this defensive roll, Salazar waited for errors and asked for any Let referee Shawn Delierre would give him. After exchanging game balls, Cesar somehow won the third despite barely being able to stand. Understandably frustrated, Cuskelly look like he may be running out of ideas. He went down 1-5 in the fourth before finally breaking Salazar's spirit and legs. 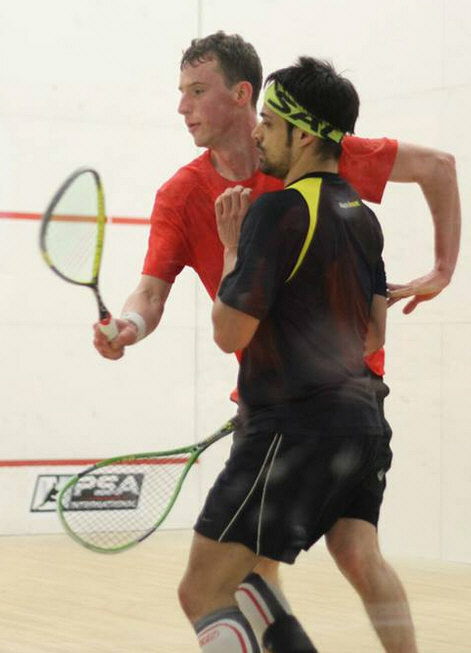 The remainder of the match was essentially a painful pressure session, with Cuskelly dispatching attacks to all areas of the court for Salazar to lift back to the front wall. At 7/2 in the decider, Cesar unfortunately cramped and the final points were a formality. Massive credit must be given to both players. They covered every corner of the court hundreds of times, never letting a single point go. Their efforts show that the mind will always break down long before the body. Tonight's quarterfinal matches lasted a whopping five and a half hours, ending well after the Sudbury YMCA's usual 10pm closing time. 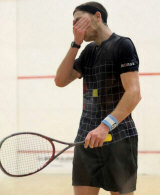 Chris Gordon was unable to build on his huge first round win, succumbing to Shawn Delierre in straight games. The American once again took the attacking initiative, playing countless volley drops on the first opportunity. However, the shots that were going for winners last night were either finding the tin or coming back with interest tonight. The Canadian did an excellent job of depending in the front left corner, playing tight counterdrops or straight lobs to neutralize pressure. 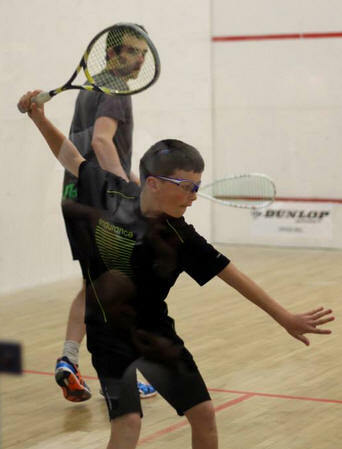 Gordon stayed competitive in every game, but was tinning out at crucial points. Delierre was content playing safe squash and waiting for these errors, eventually closing out the match with a tense 11/9 third game victory. Dutchman LJ Anjema progressed with another 3/0 win over Campbell Grayson. 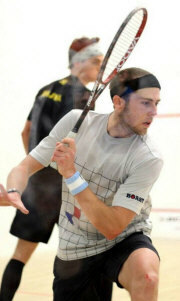 The Kiwi controlled many rallies early in the first game, but LJ found his range to take the crucial opener 11/9. The physicality began to take the sting out of Grayson, who slowly ceded control of the middle. LJ closed points out with some fine backhand volley drops and crosscourt nicks. Grayson competed very well and summoned all of his tactical and physical reserves, but could not establish enough pressure to unsettle Anjema. Worth nothing that LJ seems to be moving with total freedom and inhibition again after his recent injury layoff. South America's #2 and 3 ranked players produced an absolute classic in the third match. Crowd favourite Diego Elias beat Cesar Salazar here last year, and twice more in the intervening twelve months. Diego won the first game comfortably by closing down Cesar's open play and not engaging the athletic Mexican in the diagonal-sprints he so enjoys. After trading the second and third games, Elias looked poised to notch another victory. But Salazar is relentless, and the frequent flicks and change of direction began to fatigue the Peruvian. 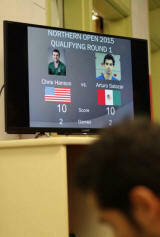 The action became more conservative and length-based towards the end of the fourth game, and referee Campbell Grayson was being grilled in Spanglish on nearly every point. Cesar converted a lead to level at 2-all, and surged ahead to 8-5 in the decider. Elias was no longer as quick on the ball or incisive in attack, but bared down to hit four winners and lead 9-8. He began to show signs of cramping and went down matchball at 10-9, but Salazar tinned an easy forehand drop to send us to a tiebreak! 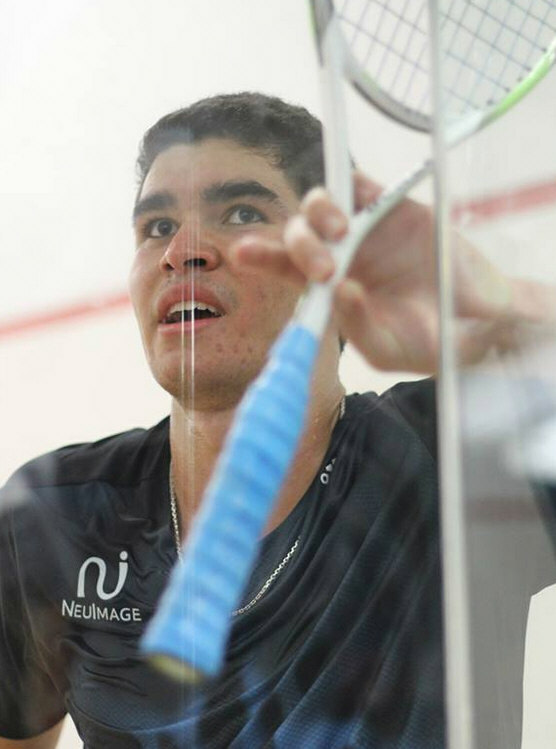 However, having sensed Diego's body failing, Cesar upped the pace and played two conservative rallies to lock down his first PSA win over the young Peruvian. The crowd thinned out before the nightcap, but the remaining diehards were treated to a dynamic, high-paced affair between Ryan Cuskelly and Alister Walker. 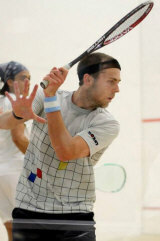 Cuskelly came out with outrageous pace, lasering straight targets and cutting drops down severely toward the nick. The experienced second seed Walker played a counter-attacking game to good effect, pushing in tight counterdrops and anticipating Cuskelly's hard crosscourts from the front. Winning several points with the aforementioned pattern, Walker took a 1-0 lead. Ryan committed to playing straight out of the front corners for the rest of the match, which turned out to be the tactical turning point. 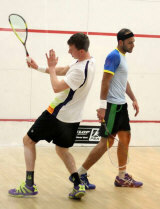 Ali continued to anticipate the crosscourt, but was leaving himself stranded as the Aussie passed him down the wall. Cuskelly grew in confidence and aggression as the match wore on, applying serious pressure by jumping on any loose ball early. He consistently worked Walker out of position and earned a 3/1 victory. Chris Gordon caused a massive upset in tonight's first round with a straight games win over top seed Marwan El Shorbagy. The American dominated early proceedings with a sharp, aggressive style that saw him slotting in drops off weak crosscourts and loose straight balls. 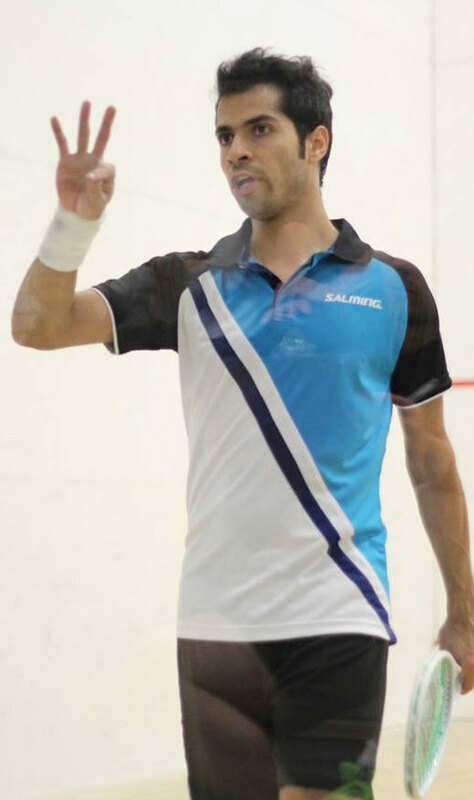 Shorbagy seemed edgy but was not showing any signs of injury or illness. Wasting no opportunity, Gordon surged to a 2-0 lead and was serving at 7-4 in the third when the Egyptian began to mount a comeback. Gordon wavered slightly with a few nervous tins as Shorbagy upped his intensity. However, the American regrouped at 9-all and played a perfect backhand volley drop to setup match ball, which was converted on a quick tin from Marwan. A career-best win for the American #1. Elsewhere, the seeds prevailed with relative ease. Shawn Delierre and Cesar Salazar dropped solitary games, but their opponents couldn't maintain that winning structure as the match wore on. 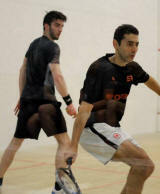 LJ Anjema looked particularly impressive, clinically defeating Shahier Razik 3-0. The Dutchman, on a comeback after foot surgery, surged ahead from 8-all in the first and was never in danger after that. Taking the ball extremely early and slotting volley drop winners, LJ simply applied too much pressure to the Canadian legend. Every quarterfinal matchup promises quality and drama; Delierre and Gordon, the top two North American players, facing off for an unexpected place in the semis ... accurate Campbell Grayson taking on the Dutch Robocop Anjema ... South American numbers two and three in a rematch from last year's event ... and seasoned Alister Walker against a keen and aggressive Ryan Cuskelly. 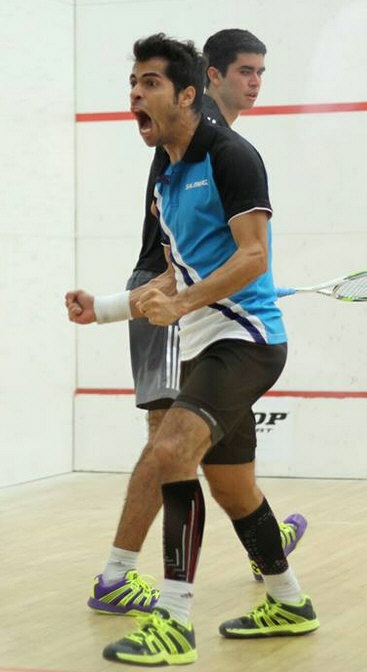 2011 Northern Open champion Shahier Razik qualified for the main draw in relatively comfortable fashion, dismissing young Canadian Albert Shoihet in straight games. Razik's trademark immaculate width, fading length and soft counters were on full display tonight, as he slowly squeezed the energy out of his countryman. 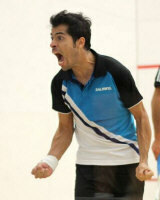 Shahier seems to be in good condition physically ahead of next week's Canadian Nationals. His reward is a matchup with LJ Anjema tomorrow, familiar foes after over a decade on tour together. The only tightly-contested qualifying final saw Arturo Salazar edge Chris Hanson in a fifth game tiebreak. Salazar came out with a clear impetus to attack shot, and managed to make Hanson work hard with a variety of boasts and drops from the back. However, this strategy does give your opponent openings, and leaves only a small margin for error. The American took advantage with crisp counter-attacks and a steadiness that lead to tins from Arturo. The third game finally saw signs of fatigue from Chris, who was slightly slow in and out of the corners after being under pressure for 30 minutes. Salazar took the third and fourth comfortably, eventually leading 7-4 in the fifth before taking an injury timeout. The three minute break served Hanson's interests though, and he came out with renewed vigour for the final sprint. Salazar tinned two easy winners at 9-8 and 10-9 up to send the match to a tiebreak. 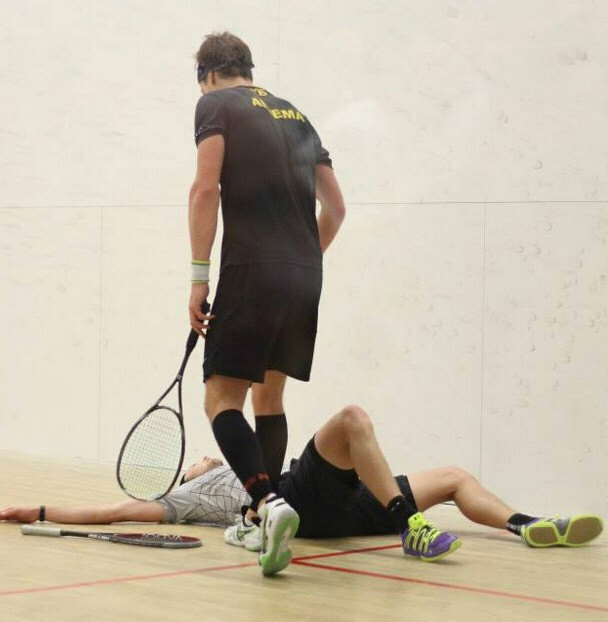 In spite of his brave effort throughout, Hanson lost his way in these final moments, conceding a tin of his own and a stroke to lose the match. Major kudos to Chris Hanson for stepping on court with Robert, a local junior who is volunteering at the tournament, immediately after losing 12-10 in the fifth. An absolutely class move by Chris, who made the young man's week despite going out in the most devastating fashion only moments before. 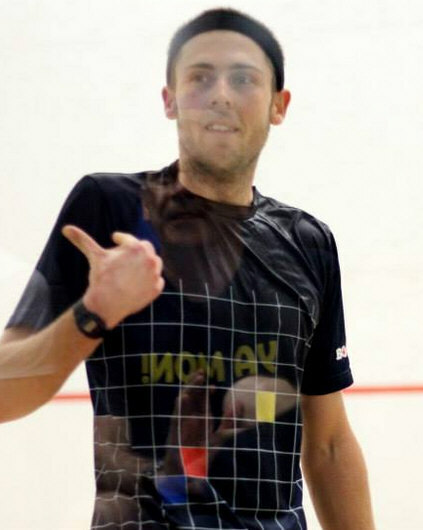 Chris Binnie eased through against a recovering Matt Serediak, who has been essentially out of squash for nearly two months with a mystery toe injury. Binnie will be looking to continue in the form that lead him to the final of Rochester last week when he takes on Ali Walker. 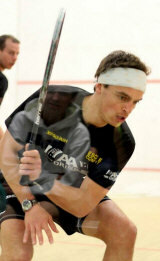 In the nightcap, Joe Chapman also smoothly navigated his path into the main draw over the Aussie Sniper, David Clegg. He will take on Campbell Grayson. 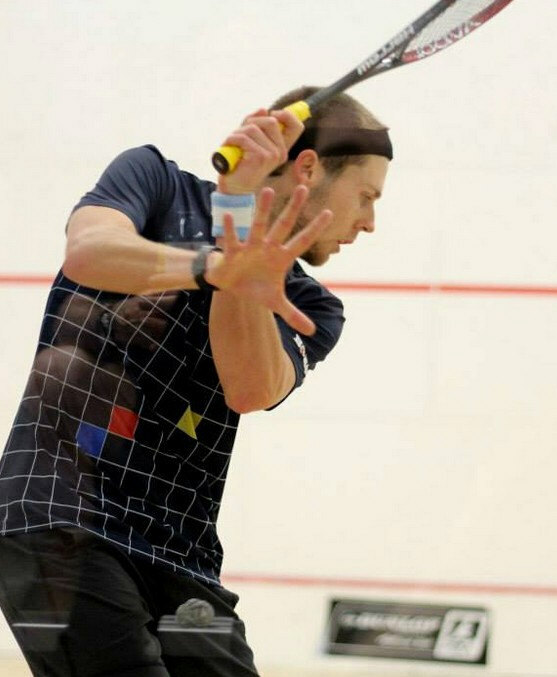 Due to a series of late withdrawals, three of Sudbury's top squash players were given the opportunity to test themselves against world tour pros in tonight's first qualifying round. Local fans turned out en masse to watch the players usually seen dominating the YMCA courts under the constant pressure applied by PSA players. Dave Morris and Trevor Beange both took some time adjusting to the pace against Albert Shoihet and Chris Hanson, respectively. But the Sudburians both settled in and managed a handful of points in each game. Ryan Abresch provided the toughest resistance to his PSA opponent, keeping it tight with David Clegg until 7-all in the first game. From there, Abresch began to falter slightly while Clegg remained steady. All three matches were played in great spirit, and the three locals were all hugely appreciative of this opportunity.